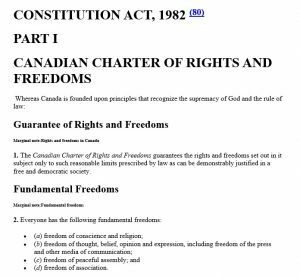 The National Citizens Alliance (NCA) supports amending the Canadian Charter of Rights and Freedoms (1982) in ten specific areas. The purpose of these amendments are to help overcome vagueness in the Charter, deal with conflicting rights and gaps in the Charter, and respond to new current realities. The NCA believes that these amendments should only be decided by the Canadian people through a national referendum. The National Citizens Alliance believes that Section 2 (a) of the Charter, which states under Fundamental Freedoms “freedom of conscience and religion” is vague and potentially in conflict with a “free and democratic society” as the overarching principle of the Charter. Canada is not a theocracy. The federal government is secular and democratic. Therefore, there should be limits to the freedom of religion that contradict a free and democratic society. The National Citizens Alliance believes that the Canadian Charter (1982) should be updated to reflect advancement in surveillance technology and most importantly including online technology, and its potential to violate the freedom and privacy of the Canadian people. Although the National Citizens Alliance supports freedom of religious belief and welcomes all faiths into the party with the exception of radical extremist faiths, as a party we believe that there needs to be a constitutional mandate for the clear, definitive separation of religion and state in federal governance. We are concerned that federal political decisions are being made that are not at distance from religion, and there is potential for even more religious based decisions as the establishment’s globalism agenda deepens. For example, the passage by the House of Commons of the M-103 Anti-Islamophobia Motion. (2) In this Act, “aboriginal peoples of Canada” includes all Indian, Inuit and Métis peoples of Canada coast to coast and without restriction or prejudice. The Constitutional Amendment Policy requires of vote of the NCA membership before it is passed. A minimum of 70 percent voting membership must support the policy with a 50 percent quorum required for adoption of policies as per the NCA Constitution (2014).